The old aphorism “Where you stand is where you sit” rings true across many sectors of society. For academic administrators, be they provosts, vice-presidents or vice-chancellors, deans or directors, department chairs or heads, or administrative support professionals, the level and scope of responsibilities clearly influence perspectives. Yet, having a understanding of the higher-education enterprise is essential to ensuring professional success and advancement. Such understanding is at the heart of this work. This handbook addresses the three key responsibilities of academic officers: inspiration, evaluation, and representation. “Getting a Good Start” deals with the promise of a new position, communicating with supervisors, and “getting around.” “Offering Inspiration and Direction” looks at the integrated scholar and “academic intrapreneurs”; diversity; the joys, challenges, and failure of professional life; and dealing with tragedies. 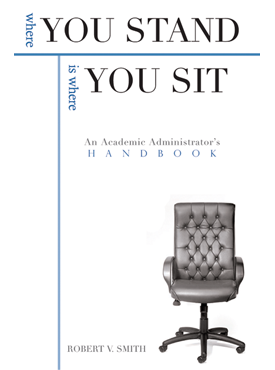 “Guidance to Various Academic Administrators and Support Staff” examines the development, roles, and responsibilities of academic officers and institutional planning and budgeting. Reviewing the state of the institution and its personnel is covered in “Assessments and Evaluations,” and “Policies and Partnerships” deals with ethics-based policies, academic consortia and partnerships, and international outreach. Throughout this valuable handbook, Smith offers background, advice, and examples that will interest both the novice and seasoned administrator as he takes us on a tour of success stories, challenges, and foibles.